Although you have probably heard a lot about surveillance systems for home or business use, you may not know just what goes into the best surveillance systems for government buildings. It is imperative to keep people safe in government buildings, and surveillance camera systems can help. Although there are a lot of different types of surveillance systems out there, all of the best surveillance systems for government buildings have a few things in common. If you are shopping for a surveillance system for a government building, you might be unsure of what to purchase. Obviously, a small and inexpensive system that you would use for home use probably won’t be sufficient for a large government building, but there are systems out there that don’t cost an arm and a leg and that are more than sufficient for government use. It might take a little bit of price shopping and comparing to find the best system for the best deal, but there are great options out there. Also, remember that safety and security are essential, especially in a government building, and it is typically worthwhile to spend a little more on a good system than to try to get by with a system that doesn’t provide adequate security. Why are Surveillance Systems a Necessity for Government Buildings? All sorts of business and activities are taken care of in government buildings, and those who are in these buildings on a daily basis could be in serious danger if no security-related precautions are taken. This type of security is important at any level of government, from police departments to courthouses and everything in between. 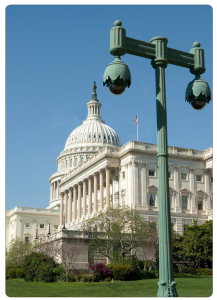 What Do the Best Surveillance Systems for Government Buildings Entail? Different government offices and buildings have different security-related needs, so you can’t expect to see the exact same type of surveillance system in every government building that you enter. For instance, a military building will obviously have greater security than a post office. There are some components that you can expect to see in almost any government-related security camera system, however. For instance, surveillance cameras are a crucial part of any type of security system, and this is especially true for government buildings. The inside of each building should be under careful surveillance at all times, and various security cameras should be hung throughout the building. It can be easy to create blind spots if you aren’t careful when installing security cameras, but it is imperative to reduce or eliminate blind spots as much as possible in a government building. It only takes one small corner that isn’t being watched for someone to pull some sort of stunt, but there is less to worry about when the entire government building is under careful surveillance. Along with having ample surveillance cameras in the building, posting cameras around the entrances to the building is a good way to keep tabs on each person who enters the building throughout the day. It is also a good idea to hang surveillance cameras elsewhere around the building; this can help you watch out for crimes that are committed outside of the building, and it can make it easier to identify those who enter and exit because there will be more surveillance footage. In order for these surveillance cameras to work properly, they have to be good-quality cameras that capture good video, and lighting in the building needs to be ample so that the cameras can capture good footage. For video surveillance in dark areas, it is best to seek either infrared night vision cameras or cameras that automatically switch from daytime to nighttime surveillance. Next, there has to be a good digital video recorder that can capture all of this footage. With a good digital video recorder, there is no need for VCR tapes; everything is stored digitally. If you are looking to install a surveillance camera system in a government building, you should look for a digital video recorder that can be hooked up to all of the surveillance cameras that you have, or you will need to purchase multiple units. Monitors are also needed in order for you and others to watch surveillance footage, both in real-time and after the fact. Along With the Best Surveillance Systems for Government Buildings, What Other Precautions Can Be Taken? Surveillance cameras are a necessity in government buildings nowadays, and they can make a serious difference in the level of security in a government building. This doesn’t mean that you should count on security cameras alone to keep a government building safe, however. Instead, it is better to use various levels of security in order to ensure that everyone is as safe as possible. Hiring a security team is typically a good idea, especially for larger government buildings. A security team can keep a constant, close eye on surveillance footage, and they can look for suspicious behavior as it happens; this can help cut down on crime and keep people safe in a government building. Along with watching the surveillance footage, security personnel can patrol the grounds; creating a strong presence can help deter crime, and experienced professionals will be available to handle situations as they arise. The use of metal detectors is also strongly encouraged for many government buildings, especially in court houses and other similar places. With the use of metal detectors, security personnel can cut down on dangerous weapons and other items that make their way into the court house, which will increase safety and security for everyone who enters the building each day. Utilizing a burglar alarm can also help prevent events from happening after-hours. Ample lighting both inside and outside the government building, gates and fences and other security measures can also be taken in order to maximize security. Figuring out the best surveillance systems for government buildings can be quite overwhelming if you have no experience, but talking to a security professional is a great way to assess what you need and purchase all of the necessary security-related equipment. Contact us today for more information.